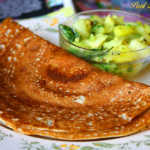 Adais are similar to that of dosais (or dosa more popularly) in shape and method of preparation. The only difference being that adais are almost instant in the sense, fermentation of the batter is not necessary. 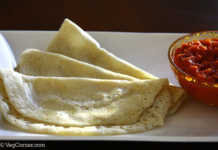 Simply put adais are nothing but a batter made with a combination of rice and lentils, thinly spread over a pan like crepes. So the varieties are limitless. One can mix and match the various types of rice and lentils to prepare healthy adais each and every time. 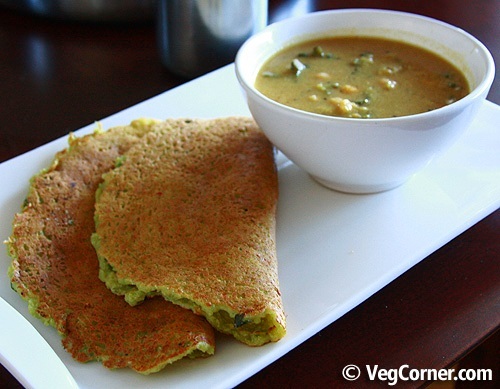 Traditional adai recipe is a combination of white raw rice, white boiled rice and lentils; but I try to make it healthier by incorporating whole grains and a variety of lentils. You could use brown rice, cracked wheat, whole cornmeal instead of the white rice and a portion of soup bean mix in place of the usual lentils. 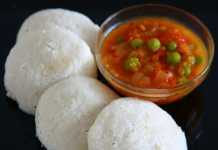 Check my brown rice and 16 bean adai recipe for instance. The only thing to note while preparing adais using the 16 bean soup mix is to soak the beans overnight. So if you don’t want to bother soaking lentils overnight, you can try the following split peas adai recipe. This too is a soup mix. It’s a 3 lentils soup mix, consisting of red split pea, green split pea and yellow split pea. Split peas does not require a lot of soaking time. If you are using white rice 3 hours in total should be fine. Since I have used brown rice, I wanted to soak it a couple hours extra and made it 5 hours. Soak the brown rice and split peas separately for at least 5 hours. Add the red chillies with the brown rice. After 5 hours, drain the rice and lentils reserving some of the water. In a wet grinder or a blender, process the brown rice along with the red chillies adding little water from time to time as necessary. Once the brown rice is blended to the consistency of semolina (sooji/rava) add the drained split peas and grind it together with the brown rice. When the split pea too is ground enough add the coconut, coriander and curry leaves and process it for another 2-3 minutes. Transfer the adai batter to a bowl; add salt and grated ginger and mix well. Add some water if necessary. Heat a griddle (non stick tava). Splash some water and it should sizzle. Now take the batter ladle full and pour it in the center of the pan and with the back of the ladle gently spread the batter into a circle as thin as possible or to your desired level of thickness. At this stage you can either add a teaspoon of oil around the adai or spray it with a non stick cooking spray or simply cover it with a lid to steam the adais and make it fat free. After a minute, flip the adai to cook the other side. Leave it for a minute and the adai is ready. Serve it with your choice of side dish. If you don’t find the soup mix, you could use 1/3rd cup each of the red split peas, yellow split peas and green split peas or any other lentils of your choice. I assure you that this will in no way spoil the adai. 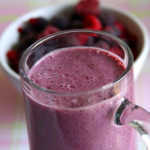 To make it cholesterol free avoid the coconut and add thinly shredded vegetables instead. A mix of carrots, cabbage and onions should be fine. Or simply mix some methi leaves. If using sweet vegetables like carrots etc, don’t forget to increase the quantity of red chillies. 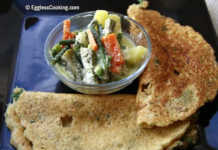 I have also tried cracked wheat instead of brown rice in this adai recipe. In that case the soaking time also is reduced considerably. 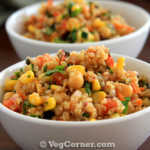 If using cracked wheat, it is advisable to grind the lentils first and then add the soaked cracked wheat. thank you for your recipe. kindly provide some information regarding the preparations/fooditems that can be taken while on long travel for about 3=4 days in indian conditions. looks yummy I always wanted to use that split peas that is available in grocery stores…will definitely try this. Can you tell what is the side dish that is there in the picture? Thanks Swarna. 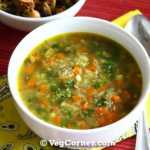 Its bitter gourd sambar. Hey Madhuram!! Congrats and Good Luck on this website.